In a Workplace Environment, Light Seam is a typically short gradient of light that defines a continuous edge of illumination between perpendicular architectural planes, most often found in circulation or transitory spaces. In a workplace setting, the use of Light Seam is most commonly found in transitory or circulation spaces where a recessed cove detail conceals fluorescent light fixtures, allowing for a gradient of light to illuminate a vertical plane. The gradient is typically short, appearing as a "fuzzy line of light"2 that outlines the edge where vertical planes met horizontal ones. Long corridors, as well as lobby areas within offices, benefits from the use of Light Seam as a method of creating visual interest and promoting a positive corporate image. The most common practices in corporate design are 1) the use of Light Seam where a vertical plane meets the edge of the ceiling plane, or 2) where the vertical meets the floor plane. Of these applications, the gradient of the light that is cast is typically short and spans between a few inches to a foot. The emphasis is the sharp backlit edge that accentuates the meeting of the planes and appears to dissolve the solid mass of the wall. The strip of light can be found both on flat planes as well as ones where the light turns the corner, curving with the plane. When a Light Seam is at the top of a wall, it makes the ceiling appear as if it were floating, but it will cause the seam to appear less dense, more penetrable, and it will appear to rise, giving an impression of the space opening outward. On the other hand, the bottom part of the wall will appear dense, less penetrable and have a sinking motion, giving an impression of secure solidity. The tonal effect created by light on the wall aligns with, and reinforces, our recognition of "down" as the direction of gravity, belonging to ground and earth, and "up" as the direction of openness and freedom from gravity, belonging to the realm of sky and air.10 The overall appearance of the walls is that of secure solidity and proud stature".11 This effect produces a desirable quality in workplace design. In instances where Light Seam is placed on the floor, "light travels up the wall. The contradiction between the tonal implications of the walls with our perception of gravity creates a tension in which weight presses down on a floating floor. The experience is that of instability".12 This stark difference created by reversing the direction of light automatically draws attention to the light source. In instances where this technique is applied in a corporate setting, it is most common to find Light Seam on the floor where the floor plane meets the bottom edge of an isolated and raised spatial volume (see the Intype Incubate). These volumes are typically settings of conference rooms or gathering spaces, and a Light Seam illuminating the bottom edge draws attention to the architecture of the form and communicates the notion that the space is unique and important. In the Prudential Insurance Company office (1976), Light Seam was employed along the wall behind a row of secretarial workstations.16 This example illustrates Light Seam's capability of transforming simple materials into a visually interesting element. 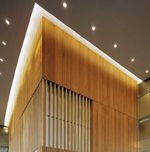 The textured wood paneling of the wall interacted with the gradient of light that shone down from behind the soffit, creating the unexpected effect of water trickling down the wall. Light Seam is able to effectively highlight a plain wall and relieve the monotony of long spans of walls.17 In the office of Brobeck, Phleger and Harrison (1980), a wood-clad wall, lit by Light Seam from above, emphasized the grain of the wood.18 The effect also increased the perceived height of the wall, expanding the space to feel larger. Alhough most examples of Light Seam used white light, some experiments have been done with the integration of color light into coves. In a public relations company's reception area (1987) architect Riero Sartogo concealed fluorescent tubes to project a gradient of blue light onto the ceiling plane of the space.19 The blue echoes the paint color of the walls, creating the overall effect that the blue plane lightens in weight as it reaches toward the ceiling, resulting in a sense of openness and airiness. In the 1990 decade, Light Seam's prevalent use was to highlight a single, drywall plane. The biggest benefit of this strategy was its ability to create visual interest in a very simple and unadorned space without requiring a big budget or significant maintenance costs. In the Apple offices by Simon Martin-VegueWinkelstein Moris (1990), the walls of the space were uniformly painted beige.20 A Light Seam along the back wall of the space drew attention in that direction, emphasizing the presence of an area for seating. In the HypoVereinsbank offices in Manhattan (1999), the highlighted wall plane was painted a vibrant yellow color that contrasted with other planes in the space.21 Light Seam added another layer of emphasis to the wall and drew attention to the artwork featured on it. 1) Light Seam was identified as an Interior Archetype in two previous studies: 1) Leah Scolere, "Theory Studies: Contemporary Retail Design" (MA Thesis, Cornell University, 2004), 109-12; 2) Joanne Pui Yuk Kwan, "Theory Studies: Archetypical Artificial Lighting Practices in Contemporary Interior Design" (MA Thesis, Cornell University, 2010), 146-47. 2) Kwan, "Theory Studies," 151. 3) Scolere, "Theory Studies," 109-12. 4) Julie K. Rayfield, The Office Interior Design Guide: An Introduction for Facilities Managers and Designers (New York: John Wiley & Sons, 1994), 182-83. 5) Rayfield, The Office Interior, 182. 6) Roger Yee, Corporate Design (New York: Interior Design Books, 1983), 216. 7) Rayfield, Office Interior, 182. 8) Yee, Corporate Design, 216. 9) Kwan, "Theory Studies," 161. 10) Kwan, "Theory Studies," 149. 11) Thomas Thiis-Evensen, Archetypes in Architecture (Oslo: Norwegian University Press, 1987), 133. 12) Kwan, "Theory Studies," 155. 13) Mark Major, Jonathan Speirs and Anthony Tischhauser, Made of Light: the Art of Light and Architecture (Basel: Birkhauser, 2004), 9. 14) Roure Bertrand Dupont, Inc.  Kahn & Jacobs; Teaneck, NJ in Anonymous, "Roure Bertrand Dupont, Inc.," Interior Design 45, no. 4 (Apr. 1974): 123; PhotoCrd: Norman McGrath. 15) Reception Area, Roure Bertrand Dupont  Kahn and Jacobs; Teaneck, NJ in Anonymous, "Roure Bertrand Dupont, Inc." Interior Design 45, no. 4 (Apr. 1974): 123; PhotoCrd: Norman McGrath. 16) Prudential Insurance Company  Daroff Design; Woodbridge, NJ in Anonymous, "Prudential's Eastern Home Office," Interior Design 47, no. 11 (Oct. 1976): 116; PhotoCrd: Tom Crane. 17) Kwan, "Theory Studies," 159. 18) Brobeck, Phleger and Harrison  Gensler; San Francisco in L.W.G., "Elegantly Explicit," Interior Design 51, no. 5 (May 1980): 222; PhotoCrd: Jaime Ardiles-Arce. 19) PR Agency  Riero Sartogo; Rome, Italy in Edie Cohen, "Roman Views," Interior Design 58, no. 7 (May 1987): 276; PhotoCrd: Anonymous. 20) Apple  Simon Martin-Vegue Winkelstein Moris; San Jose, CA in Edie Cohen, "Apple Computer," Interior Design 61, no. 6 (Apr. 1990): 193; PhotoCrd: Chas McGrath. 22) HBO  HLW; Los Angeles, CA in Edie Cohen, "Outside the Box," Interior Design 76, no. 2 (Feb. 2005): 156; PhotoCrd: Benny Chan/Fotoworks. 23) U.S. Census Bureau Office  SOM; Maryland in Laura Fisher Kaiser, "Let the Numbers do the Talking," Interior Design 77, no. 14 (Nov. 2006): s20; PhotoCrd: Eduard Hueber/Archphoto. 24) Brian O'Doherty, White Cube: The Ideology of the Gallery Space (Berkeley, Cal. : University of California Press, 1986), 35. 25) Law Firm  HLW; New York City in Judith Davidsen, "The Discovery Process," Interior Design 80, no. 7 (May 2009): 187; PhotoCrd: Eric Laignel. 26) Evidence for the archetypical use and the chronological sequence of Light Seam in workplace design was developed from the following primary sources: 1970 Roure Bertrand Dupont, Inc.  Kahn & Jacobs; Teaneck, NJ in Anonymous, "Roure Bertrand Dupont, Inc.," Interior Design 45, no. 4 (Apr. 1974): 123; PhotoCrd: Norman McGrath; Reception Area, Roure Bertrand Dupont  Kahn and Jacobs; Teaneck, NJ in Anonymous, "Roure Bertrand Dupont, Inc." Interior Design 45, no. 4 (Apr. 1974): 123; PhotoCrd: Norman McGrath; Prudential Insurance Company  Daroff Design; Woodbridge, NJ in Anonymous, "Prudential's Eastern Home Office," Interior Design 47, no. 11 (Oct. 1976): 116; PhotoCrd: Tom Crane / 1980 Brobeck, Phleger and Harrison  Gensler; San Francisco in L.W.G., "Elegantly Explicit," Interior Design 51, no. 5 (May 1980): 222; PhotoCrd: Jaime Ardiles-Arce; PR Agency  Riero Sartogo; Rome, Italy in Edie Cohen, "Roman Views," Interior Design 58, no. 7 (May 1987): 276; PhotoCrd: Anonymous / 1990 Apple  Simon Martin-Vegue Winkelstein Moris; San Jose, CA in Edie Cohen, "Apple Computer," Interior Design 61, no. 6 (Apr. 1990): 193; PhotoCrd: Chas McGrath; HypoVereinsbank  Gerner Kronick + Valcarcel; New York City in Abby Bussel, "Grid City," Interior Design 70, no. 1 (Jan. 1999): 137; PhotoCrd: Paul Warchol / 2000 HBO  HLW; Los Angeles, CA in Edie Cohen, "Outside the Box," Interior Design 76, no. 2 (Feb. 2005): 156; PhotoCrd: Benny Chan/Fotoworks; U.S. Census Bureau Office  SOM; Maryland in Laura Fisher Kaiser, "Let the Numbers do the Talking," Interior Design 77, no. 14 (Nov. 2006): s20; PhotoCrd: Eduard Hueber/Archphoto; Law Firm  HLW; New York City in Judith Davidsen, "The Discovery Process," Interior Design 80, no. 7 (May 2009): 187; PhotoCrd: Eric Laignel.